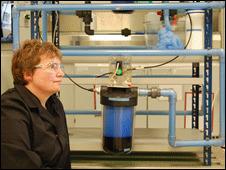 The National Nuclear Laboratory's Fiona Rayment tours Sellafield's new research centre. 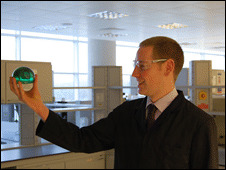 Staring into a dark green crystal ball, nuclear engineer Matt Clough is eyeing the future. "The basic idea is that it's transparent when it's new," he grins, holding it up against the light. "The darker it is, the more radiation it's absorbed." Mr Clough is a member of a team of scientists at the recently-established National Nuclear Laboratory, a nuclear technology services provider owned by the state, but run as a private enterprise. Mr Clough and his team are behind the RadBall, or radiation ball, made from a polymer material that becomes opaque when exposed to radiation. To nuclear decommissioners, who are working to clean up the mess left behind from half a century of nuclear weapons and energy production, the RadBall could soon become a vital tool. The RadBall's main advantage is that it is very portable. "You can use it in hard-to-reach areas in the plant and in areas where electric devices struggle with high radiation levels," Mr Clough explains. "It tells us where the hazards are and how severe they are." "We're actually trialling it on plant at Sellafield at the moment, so the technology is being used in the field," says RadBall's inventor, Dr Steven Stanley, who won the young engineer of the year award for his creation. High up in a 120m tall building, half the height made up by a fragile-looking chimney, a team of nuclear decommissioning experts are prepared for the worst. 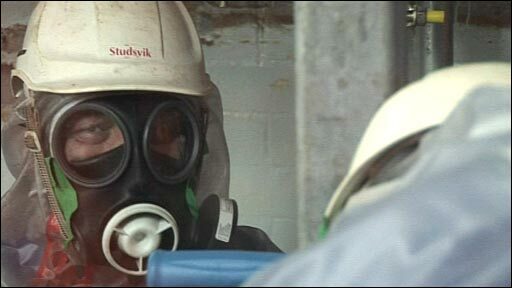 Dressed in PVC suits and wearing breathing apparatus, they work behind a sealed, low-pressurised canvas cover, chipping away at a steel and concrete structure that will eventually be demolished. The building is structurally unsound, its steels corroded, its concrete brittle, damaged by years of exposure to nitric acids used to separate chemicals in the nuclear reprocessing cycle. And tucked away in small rooms in the building, known as cells and caves, there is an almighty concoction of nuclear waste just waiting to be cleared away. For better or for worse, it was in this building at Sellafield where the foundations were laid for the UK's role as a Cold War power to be reckoned with, its nuclear weapons ring-fencing its permanent seat on the United Nations Security Council. During the 1950s, fuel rods from early nuclear weapons programmes were separated into three products: uranium, fission products (which create the greatest radiation problem) and plutonium. Later, in the 1960s, fuel from second-generation advanced gas-cooled nuclear reactors was reprocessed, at a time when the population at large was still taken in by a Utopian vision of a nuclear future with electricity "too cheap to meter". Cleaning out the nuclear waste from the cells and caves is a complicated process that requires a peculiar mix of "big eggheads and people with strength and energy", grins decommissioning manager Euan Hutton as he inspects the work. The mix of brains and brawn at Sellafield makes for a jocular atmosphere. Conversations flit between laddish quips about almost ghostly, invisible radioactive threats - "I'm not going up there, no way!" - to complicated scientific explanations about nuclear fission. At times the two cultures meet - for instance, when radioactivity is described as "a dog turd on the pavement" and contamination as "when the turd is trodden into the house". The contamination risk is taken seriously at Sellafield. Anyone entering the site's inner sanctums must have any open sores on their hands or face covered. Special boots and overalls must be worn. Food, medicine and tobacco are banned to prevent hand-to-mouth contamination. Leaving the site is even more complicated. 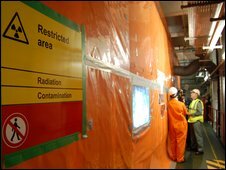 It involves thorough checks of equipment and personnel, with specialists labelling bits of kit as they make sure no radioactive waste - in however tiny quantities - is inadvertently taken off-site. Add the strict security - Sellafield is sprawling with police and security guards and operated in accordance with rigorous access rules - and it becomes obvious that operating here requires generous helpings of both patience and cash. All over the place, there are small groups of people standing around, waiting for clearance and permission to enter or exit particular areas. The Sellafield management insists processes are simpler for workers than for visitors, yet the smallest task becomes a time-consuming, and by definition costly, exercise nevertheless. Radiation is another story altogether. When contained, it is controllable. If it escapes, it is detectable. Everywhere you go at Sellafield, there are sensors and alarm systems - their default setting a series of rhythmical bleeps. Only if the bleeping stops is it time to be concerned. You might think such a tortuously regular background noise would drive people nuts, but those who work here say they find it comforting. To nuclear engineers and scientists, radiation poses more than just danger. 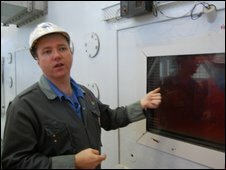 To decommissioners, radiation offers a map of the problems at hand, a guide to the challenges ahead, a job and an income. 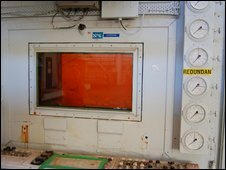 At its grittiest, decommissioning Sellafield involves scraping contaminated concrete off the walls. It could take decades to complete the work. The first thing to do, observes Mr Hutton, is to secure the building. Anything heavy is removed to lighten the burden on the building's structure. A specially developed lightweight foam cement is pumped into eight-tonne vessels full of contaminated chemical absolvers. Only then can the nuclear clean-up begin. In the former reprocessing building, the radioactive waste is contained in small but solidly constructed rooms, called cells or caves, built with little or no thought about how they should eventually be dismantled. Some do not even have windows or doors. The challenge for the decommissioners is to clean out the cells and caves, ideally without entering them. It is in places such as these where the RadBall comes into its own. In order to map out how strong the radiation levels are and their exact source, the RadBall can be placed within the radioactive cells or caves, either by workers dressed up in protective suits, or by remotely controlled robots or cranes. "The technology is a bit like the things at the fairgrounds, where you have to grab a toy," enthuses Dr Stanley. Dr Stanley works in the National Nuclear Laboratory, which, at times, comes across as a James Bond-style gadget factory. And as his boss, Dr Fiona Rayment, head of research, rushes to show off the lab's best gadgets, she bears a fleeting resemblance to Q. The RadBall is a prime example of technology developed here to help with the clean-up of the so-called "legacy waste". 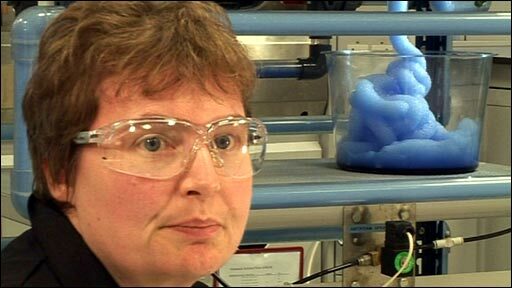 That is waste left behind from decades of weapons and energy production, she says, as she demonstrates another example: a special foam that has been developed to flush out contaminated material from Sellafield's myriad pipes before reducing the waste volume by at least 50%. "There are all those foams that are used in the kitchen, so we thought, 'Why can't we have some foamy stuff?'" she says with a grin. "It can be any colour you like." Fun and funky, for sure, and no doubt very useful for decommissioners, though this is small beer compared with the lab's biggest gadget. Around the corner, down some stairs and through a vast door, the way leads to a hangar-sized facility, kitted out wall-to-wall with stainless steel glass-fronted caves that enable scientists to carry out remote-controlled nuclear research. 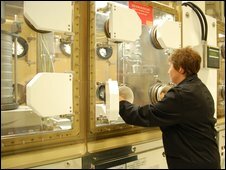 In an adjacent room, a similar row of smaller cells - so-called "glove boxes" with integrated rubber gloves - allows them to touch and feel the plutonium as they carry out experiments. The research facility, which is to be made available to companies operating in the nuclear industry, will be a useful resource in its own right, explains Dr Rayment. But perhaps more importantly: this nuclear facility has been built with a clearly laid-out and costed plan for its clean-up and eventual decommissioning. As such, it demonstrates that future nuclear power plants, scheduled to be built in large numbers in the UK and other countries over the years to come, are well-placed to escape the decommissioning nightmare created by the legacy waste at Sellafield. Clean-up costs and decommissioning strategies are part of the new-build business plans, their proponents insist, hence costs should not gallop out of control. So while the biggest job at hand at the world's most complex nuclear facility remains sorting out the past, the people working at the National Nuclear Laboratory have the future firmly on their radar. How is nuclear waste transported?